Free setup, no contracts, no cancellation fees, 30-day risk-free trial or your money back guaranteed. All 1800 phone numbers include amazing phone system features – a professional automated telephone system priced and designed for small businesses and startups. UniTel Voice has 100% USA-based customer support with free personal VIP setup with your own personal account manager. Call quality is ensured through a redundant network and you have the option to forward your toll free number to a landline, cell, VoIP or SIP. 1. 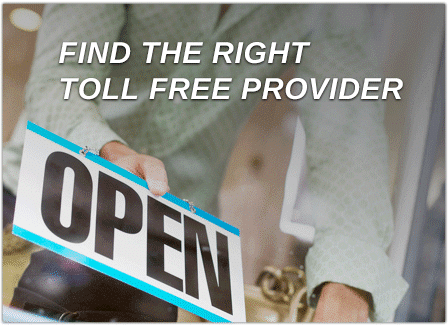 There’s a ton of toll free service providers out there – so shop around, and you’ll see UniTel Voice is the best option. Choosing a business phone service can be extremely confusing especially when it comes to getting a 1-800 number. If you already have commercial phone service established with your local phone company, you could call them and likely add a toll free line to your existing plan. However, in many cases you can find a better rate with better services through a company like UniTel Voice that specializes in toll free number services. If you don’t already have business phone service setup, and you don’t think you need anything too fancy or expensive – you should also consider UniTel Voice. Why? Shop (or “google”) around and you’ll see compared to other toll free number service providers, UniTel Voice offers several competitively priced plans designed for growing businesses. With UniTel Voice’s toll free plans you can move to a larger service packages as your call volume on your toll free number increases. This allows you to cut cost as you grow. Additionally, all plans include essential features like call tracking, advanced call forwarding and virtual greetings/voicemail that you can set up and customize to meet your business needs. You might not think you need these features now but as your business grows you’ll be happy you have them. And every account, big or small, gets access to our team of toll free service experts that provide personalized customer service to make sure your toll free service is up and running quickly with all business needs met. 2. What makes UniTel Voice the best toll free number service for startups and small businesses? First it’s cheap. Second, it’s super easy to set up. You can sign up for a great custom toll free number in seconds. Once you’ve created your account your up and running and it works with your cell phones or smartphone app. In a matter of minutes, you can get toll free number and sound like a Fortune 500 company with a professional business phone system. 3. What makes UniTel Voice an outstanding toll free provider for businesses of any size? Since the early 1990s UniTel (now UniTel Voice) has been providing toll free service to companies large and small. And whether you’re a brand new business or a large call center, UniTel Voice has a plan that can meet your needs. There’s four areas where UniTel Voice has tried to surpass other toll free number providers and that’s: price, call quality, features and customer service. Pricing: It’s easy to compete on price because we have a large happy customer based and we are our own Resp Org and switch – which is technical telecom speak cutting out the middle man. Check out our plans & pricing here. Quality: Ironically, this helps us maintain call quality standards because we control the network and can better monitor the technical infrastructure to ensure the highest industry standards. Lean more about us here. Features: When it comes to features these days almost all toll free providers offer the same stuff, multi-line call forwarding, greetings, voicemail, extensions, call tracking, faxing, time-of-day routing etc. When it comes to features the differentiator isn’t how big your feature list is but how easy your features are to use. UniTel Voice competes on design. We made our phone system easy to use for busy entrepreneurs, not technical IT guys who love buttons, switches and computer code. See all of UniTel Voice’s features here. Support: At the end of the day, we feel that customer service (i.e., support) is the best place for phone companies to differentiate themselves. That is why we don’t outsource our customer support team like many of our competitors and we offer every business (big or small) the opportunity to meet with a personal account manager to help them get thing set up and going. Learn more about our support here.